“Guess you won’t be hiking as much anymore now that you’re pregnant…” How many times did I hear that when we first told people that Little Man E was on the way? 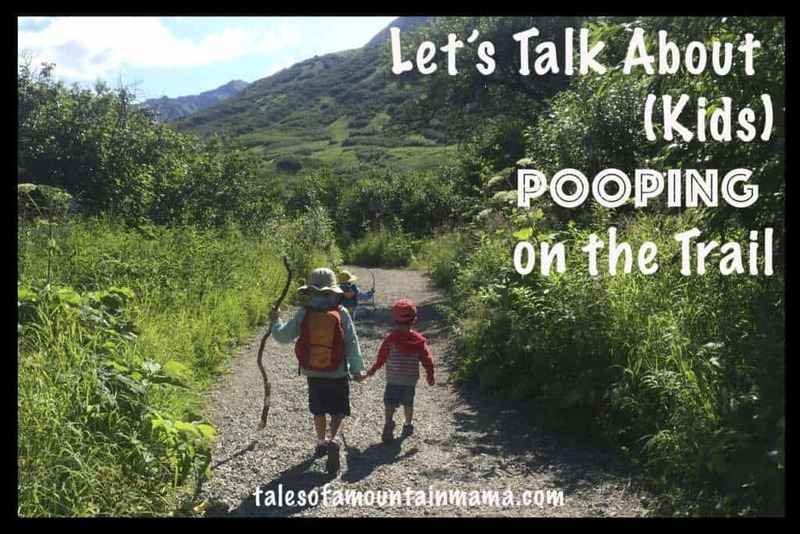 Since my husband and I first got together, hiking, camping and general outdoorsiness had been a staple of our relationship, but now that there was a baby on board, that had to change? Fortunately, that answer was NO. But it took a little while to know that was the right answer for us. Innately, getting out on the trails, breathing deep and stretching my legs seemed like the most natural and healthy thing that I could continue to do as this baby grew in my belly. But there was that nagging part of my brain… that omnipresent cloud that second guessed every little thing. What if I exert myself too much? What if I trip? What if I fall? What if we hike too far? What if I get too hot – will the baby overheat? What if a tick bites me? You name it, I worried about it. So for my sanity and the health of my weeks old little embryo, I started researching – surely on the great big Internet there would be lots of information about other women who camped and hiked throughout their pregnancy. Unfortunately, I didn’t find much. Thankfully, around week 8 I had my first appointment with my midwife where I could finally broach the subject with an expert. To my great relief, she was thrilled to hear that we were hikers and fully endorsed hiking throughout the pregnancy. She even gave two big thumbs up to a Rocky Mountain hiking and camping vacation that would fall around week 16 in my pregnancy. Disclaimer: Every pregnancy is different for every woman. ALWAYS listen to your health care provider and follow her recommendations. This is simply what worked for me. Hydrate, Hydrate, Hydrate. My midwife recommended drinking 80 – 100 oz. of water every day and increasing that intake on days that we hiked. Yes, this meant a LOT of bathroom breaks, but this hydration was key for me to maintain good energy, avoiding a racing heart rate in the middle of the night after a long day’s hike (that happened once!) and staving off muscle cramps. My husband even started packing his portable water filter to make sure we’d always be able to have a clean water source if I ran out of water in my pack – even on short hikes. Snack Often, Snack Healthy. Crazy blood sugar drops were a hallmark of my early pregnancy. I’d be fine one minute, then the next I was a hiking zombie. Eventually I learned to nibble on a granola bar or grab a handful of trail mix the first moment I felt the rumble of hunger. This helped keep my revved up metabolism in check. Exercise at Home. Staying active even when not outdoors made a huge, positive impact on my pregnancy. I fell in love with two prenatal workout videos (Summer Sanders Pregnancy Workout and Pilates During Pregnancy). The point of these workouts was to prepare my body for pregnancy and labor, but the added benefit was that I was stronger and had better stamina on the trail. Trekking Poles Are Your Friend. Around 20 weeks is when I really started getting concerned about trips and falls. 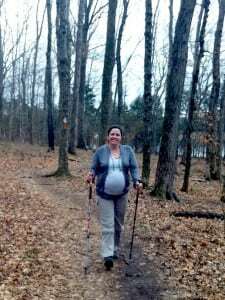 To keep my balance, I slowed down in places where the footing seemed iffy and later in the pregnancy my husband surprised me with a of pair trekking poles. If I could do one thing differently, I would have started using trekking poles early in my second trimester. They helped reduce the impact of round ligament pain and helped minimize my fear of slips, trips and falls. A friend who hiked during her pregnancy also found a pregnancy support belt to be a great help, too. Challenge Yourself, But Listen to Your Body. 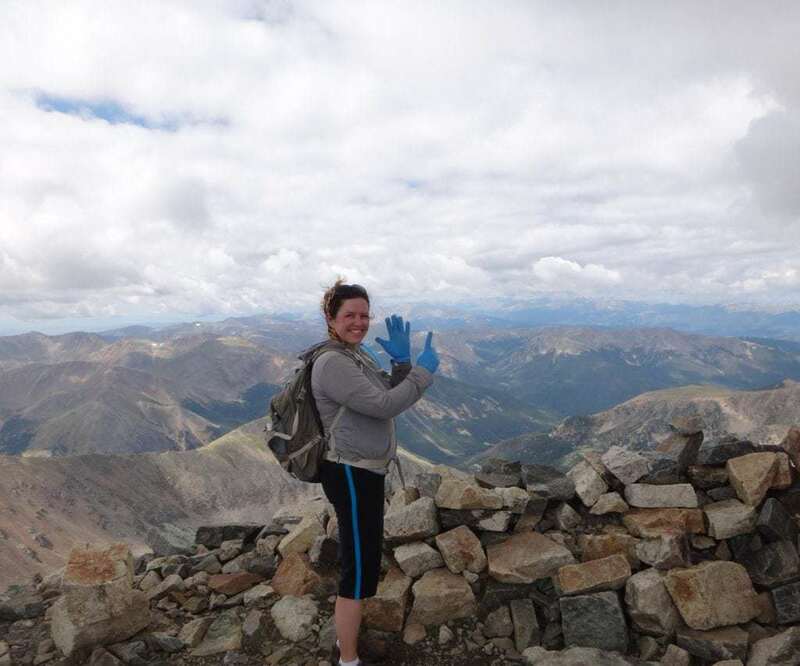 I summited my first two mountains during my second trimester – one in the Smokeys and the other a 14’er in the Colorado Rockies. I was proud to be able to take on these challenges with a bun in the oven; however, I always listened to my body and slowed down if anything ever seemed “off.” On more than one hike, we turned around and headed home early – I was proud that I got on the trail but never regretted the change in plans if I didn’t feel right. Get Some Rest & Take It Easy. I was intentionally very active during my first two trimesters, but that activity was followed up by a whole lot of resting! I’m pretty sure I conked out for a good long nap on every car ride home. And as my belly grew, we exchanged long hikes with challenging climbs for shorter distances, flat lands and a much slower pace. I took my last pregnancy hike during week 39. We didn’t go very far and we certainly didn’t go very fast, but that hike energized my spirits in ways I never expected. That quiet afternoon in the woods was an unexpected respite from the anxiety and excitement that had been building for nine months. Four days later, Little Man E arrived and my world has never been the same. What about you? 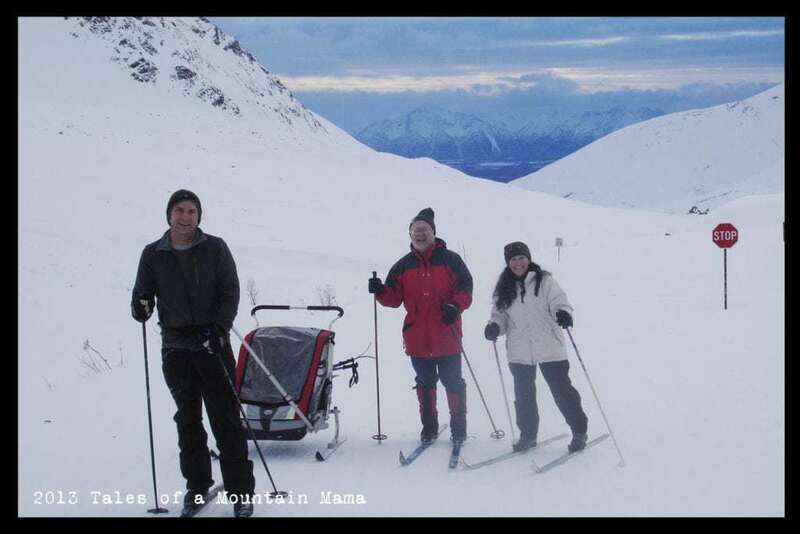 How were you able to maintain an outdoorsy lifestyle while pregnant? Amy Packer is a mama, wife, blogger, nature enthusiast and Pinterest-lover from Nashville, Tennessee. When she’s not chasing after her young son, she’s likely hiking with her husband in the Tennessee hills, trying out pins or curating their blogs: Marking My Territory, an outdoor lifestyle and camping recipe blog where you can read her series of blog post about hiking while pregnant during each trimester, and Pinterest In Real Life, a blog detailing her (mis)adventures spawned from Pinterest inspiration. LOVE this post! I ran and hiked through both of my pregnancies. One of my favorite pregnancy photos is from a hike. I’m holding my daughter’s hand as we hike up a hill with my basketball belly leading the way! Love your tips for staying active throughout pregnancy, especially to listen to your body and rest when you need it. Thanks, Nicole! Yeah, one of my proudest moments was during our Colorado Hiking Vacation when I was 16 weeks pregnant and able to confidently scurry up the side of a waterfall (I was super cautious & it wasn’t that steep!) when other folks (men & women) were turning around because they weren’t used to the terrain. And aside from the physical aspect it helped my mental health SO much! 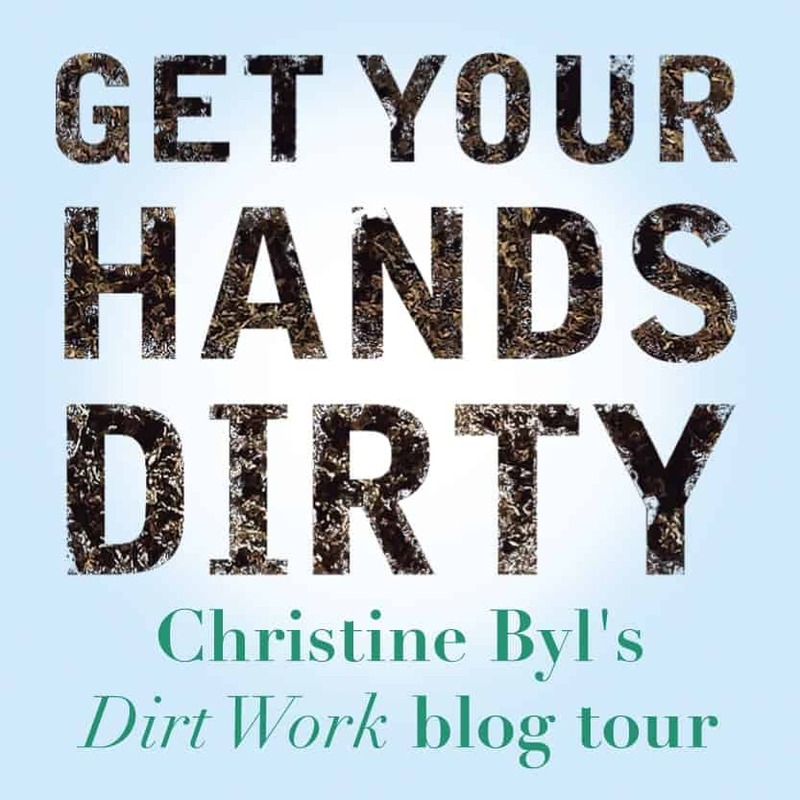 I’m so happy to read your guest blog here, my friend! I love your mantra – pregnancy is not an illness. Thanks for the info an inspiration! I am currently debating a Half Dome hike when I will be 12 weeks. Thoughts? Thank God for wonderful midwives and telling us we are not sick just pregnant!! Great post and I didn’t hike while pregnant but I did ride horses and did a lot of walking. Love this article. As a trail runner, I loved getting out and running the trails during the first half of my pregnancy. Now that I’m entering my third trimester, hiking those same trails has taken over and has made such a huge impact for my sanity and overall health. Although prenatal yoga has been awesome, it’s indoors. I love getting to be outside amoung the trees and mountains. I’m definitely slowing down, and generally have to plan for a nap after a workout, but when I listen to my body and just focus on moving at whatever pace my body needs that day, it’s invigorating. Amy – that’s awesome! And yes, staying sane is HUGE when pregnant (and for me too it means outdoor time!) Thanks so much for your insight – when is Baby due again? Such an amazing story!! I’m going hiking today and 18 weeks pregnant…. I found your story so inspirational! I “Shared” this story and your Blog to my Between Moms page on Facebook and our “Need To Know” board on Pinterest! My husband and I are backpacking/camping in Alaska (around Denali first, then up into the arctic circle) this summer when I will be around 23 weeks, it’s our first. Where did you find hiking pants/clothes that fit and were appropriate for your trip? I’m having so much trouble trying to plan and collect everything I’ll need since I have really no idea what size I’ll be then. Awesome! So great you are getting out still then – it’s probably the perfect time in your pregnancy to do so 🙂 Ok, so the ONLY clothes I have found are from Mountain Mama Maternity. They work the whole pregnancy and afterwards too (I wear them daily now 5 weeks out from baby being born.) Here’s a couple links to reviews I did that may help! Check out the Make My Belly Fit thing too – GREAT for making your jacket work for the trip and then for baby later. my only question is- is the pressure of the backpack belt over the pelvis/belly ok? i did a 27 mi backpack this weekend- i’m 14 weeks and felt good- my legs are just sore now! I would say it is ok if it is sitting UNDER The belly! But, as always, please check with your doctor first! Love your blog. Just in my first trimester and headed out backpacking! YEA! 🙂 Good for you! Would love to see photos! I’ll be 13 weeks and will be planning a backpacking trip from Tolumne Meadows to LIttle Yosemite Valley. How did your hike go? Good for you Samantha – I think you’ll be fine, just tired!! Thank you for this post! I live in Alaska and I love to be outdoors. 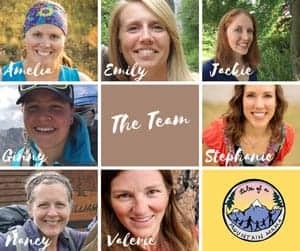 I am planning a girls backpacking weekend with some friends. I was starting to feel really apprehensive about the trip and was starting to worry a lot. This put my mind a little more at easy. We are doing a 26 mile, 2 day trip over a mountain pass. It’s about 2,100 ft elevation gain, however, one of my biggest concerns is fording a glacial river (will it be too cold?). I’ve been doing some shorter day hikes and make sure to keep hydrated and to eat well and so far no problems. But I keep thinking with this trip, “Am I over doing it?” I did this hike before I was pregnant in one day and thought nothing of it. I will be at about 12 weeks when we do the hike. Are you doing Crow Pass? Definitely ask your doctor, but I am pretty confident he/she would tell you to go for it as long as you feel well enough! Everyone is different in pregnancy. Personally those first 15 weeks or so I am so exhausted I can hardly do anything. But, I did do a 77 mile bike ride in 90 degrees this time around…. Let me know where you are hiking – I’m curious! 🙂 Grew up in the Mat-Su valley and am missing it desperately this summer 🙂 Minus the mosquitos…. We live in CO at 7200 feet and are looking for information about hiking 14rs when pregnant, especially in the first trimester, now. We can’t find any solid information out there. Everything says either “bla bla not recommended but we don’t have any real proof that it’s bad” or “you go girl….but we have only limited empirical evidence from my friend and I.” Even with Doctors and widwives you will get wildly varying answers depending on the person. And god forbid you post something about it in an online forum; you will be torn apart by bon-bon eating couch-wives. I want to keep my wife and my family active but I want to know more about safety concerns if there are any. Doing this kind of activity is not new to her, I just want more information. I like to believe that strong active Moms make strong, active babies, but I don’t want to worry about lack of oxygen. Have you come across any strong evidence either way? Thanks for the inspiring site btw, it’s nice to know we aren’t the only active parents out there who want to stay active and do it safely. I have not come across hard evidence, but I think the best thing is to take it easy as you move forward, have her drink a ton of water, be prepared to move slow and turn back at any sign of not enough oxygen. If she’s feeling great, I’d go for it. But, understand that you’re just ready for “Plan B” should you need to take it. Hi Alex – I am no doctor, but as long as you are feeling well at 12 weeks, I think you’ll be good! But, I would always check with your doctor and really listen to your body – every person is different! I know it may sound really dumb but im worried to go hiking while pregnant. Before I was pregnant I would go hiking all the time on long hour hikes away from civilization deep into the mountains or desert. But now im scared because now that im pregnant i know my body is releasing all these hormones and I feel like a bear, coyote, or snake can smell them miles away and try to attack me and baby. Am I just crazy and being over dramatic? I really do want to go hiking while pregnant, but dont want to be attacked by a wild animal. Great article! I live in Arizona and there are so many places to hike out here. I am 27 weeks and I feel great! I hope I can keep hiking through the rest of my pregnancy. I’ll let others weigh in, but I think sometimes you forget what pregnancy is REALLY like until you are in the middle of it again 🙂 When I was 4 months with my 4th baby, I was NOT comfortable carrying a heavier pack. However, I would have with my 1st. So, depends on the person totally….Wish it were more black and white, but pregnancy is SO grey area. :/ It’s all about paying attention to your body, staying healthy and going with it!! I usually keep hiking early in pregnancy, but have to stop anything long or rigorous after a few months. I’m 32 weeks with baby #4, and with all c-sections, I’m definitely limited. My favorite is summer babies, though, because I love swimming and being at the beach late in pregnancy! I went kayaking the day I was due. I stayed pretty active all through my pregnancy, and I figured either we were going to get the kayaks and gear all loaded up and I would go into labor (Murphy’s Law, you know) or I would have a great time kayaking and not be thinking about when I would be having that baby! Hey! How do you feel about water filtration while pregnant? I have no problem drinking filtered water from the creek/river when not pregnant, but is there extra filtering you should do when pregnant, or what? Thanks! Thanks so much for posting this! I was on an overnight hike this weekend at 14 weeks and instead of 2 nights, we cut it down to 1 because I was feeling a little *off*. My husband was really supportive and on the drive home we agreed to stop the back country camping, and do only day hikes for the remainder of my pregnancy- but the feedback we got from family and friends was so discouraging when they heard we had to turn back! I was beginning to feel guilty, even though I feel fabulous after that little walk through the woods! Good for you for listening to your body! I think that is the hardest thing…because we Mamas think we are invincible sometimes. And, yes, a walk in the woods does wonder for the soul. Good luck with the rest of your pregnancy! Something about hiking for two was extra rewarding, carrying my little lentil up the highest peak of the US was something I’ll always remember. I feel great, and wear a heart rate monitor to make sure I am not going overboard. When it gets a little too high for my liking, I just slow down or take a quick rest. Thanks for this post, I’m glad to see there are more mama’s like me! Next week I’ll be hiking and rafting through Big Bend National Park (currently at 22 weeks), so excited! Thank you Amy for your blog. I’m anxious about going on a hike while pregnant due to risks and most people around me advice to be very careful and stop doing my usual activities. However, my body is itching to go on trekking again. I’m a runner and an outdoor person. My husband and I love hiking and long distance running. I ran a marathon while 4 weeks pregnant without knowing that a little miracle is growing inside me. Did some indoor wall climbing and bouldering as well. My doctor still allowed me to run but with slower pace and less mileage than the usual. Thank you SO much for writing this post. I am a first time mother, and an pretty avid hiker. I try to get out almost every single weekend. Now, being pregnant, i somewhat feel that I’m hindered in hiking. What if i hurt the baby? etc.. This is very informative and ill make sure to bring it up to my Dr when i see him next. I’m currently 15 weeks pregnant and have been going like normal times, if not maybe a little easier then normal. I’ll be heading to Vancouver Island when I’m around 6 months pregnant and plan on doing a lot of hiking and I’m a little worried i wont be able to handle it. But this gives me reassurance that i should be able to go froward with it. Thanks again! I love this! I hiked through both my pregnancies. We live in Colorado at 6000 feet and the two things my OBGYN told me were not to go above 9000 feet because I wasn’t acclimated to it and to stay at a pace where I could carry on a conversation. With my second son, my appendix ruptured at 19 weeks, I had to have surgery to remove it, and subsequently became very sick from the infection. All my doctors involved felt that it would have been much worse had I been an unhealthy and sedentary person, and I would have most likely lost the pregnancy. So, along with good medical care and antibiotics, hiking and being active really did help save my life, as well as my sons life. Oh scary!!! That actually happened to me with my first too at 32 weeks….and then baby came early! It’s all about total health! Yes! Pregnancy is not an illness! 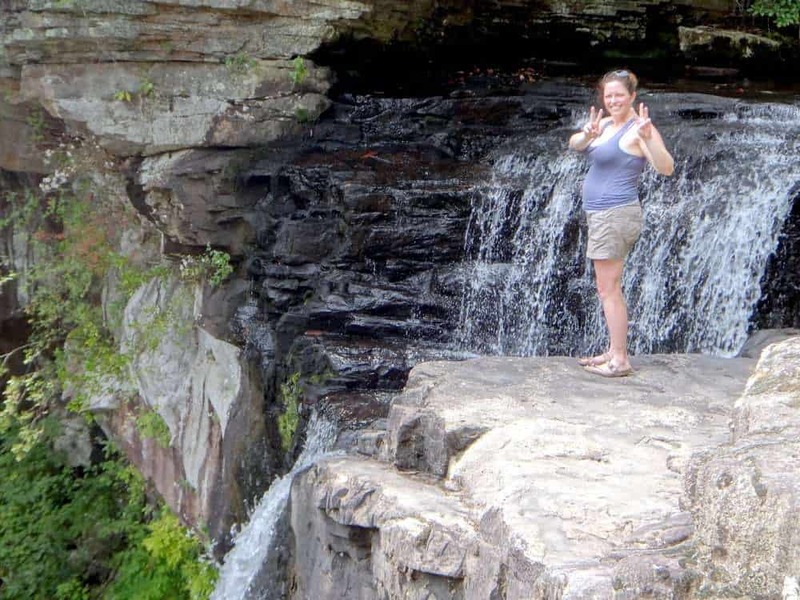 I continued to do all my favorite outdoor activities throughout both of my pregnancies including kayaking on my due date with my first and hiking on my due date with my second. I even took a Mommy/Son camping trip with my son (2) while pregnant with my daughter and continued to carry him in a backpack until my belly got in the way of the hip belt. The key is to listen to your body (and your dr.). You know when you need to rest or if something feels off. You also have to accept (and don’t feel guilty about) having to modify what you would usually do, like picking a shorter hike, traveling at a slower pace or taking more breaks. This is a really useful article, thank you. Very inspiring! I’m just wondering, and sorry if I missed it, how long your average hike was at around 24-26 weeks? I am looking at doing a rather steep but short walk at that time, probably up and back in a day, but I am keen to camp. I’ve done it before, so it’s not unknown but how I will be is. I am relatively fit and walk 30 minutes every day. I think this walk would be around 4 hours return. I am a photographer, so would need to carry that gear but otherwise would try to keep my load to a minimum. I will talk to my OB, but just interested in your opinion. Thank you!! Hi, thanks for this post. I’m looking for advice or maybe reassurance. We are really torn over a trip we have planned to Banff and Glacier when I will be 30 to 32 weeks pregnant. I went into my first pregnancy in good shape, (day hikes, yoga and gym every week, 3 to 5 day hiking trips a few times a year, etc) and hiked/walked throughout. We did hiking holidays up to 17 weeks (but just day hikes), and carried on with weekend day hikes almost throughout – just getting shorter and flatter. I did notice that already by about 20 weeks I was MUCH slower, especially on the uphill. I feel I’ve gone into this pregnancy less fit – a toddler has eaten into my gym / yoga time, and while we still walk every weekend, it’s shorter / easier / toddler-friendly. I’m having much more lower back pain. (Also, I am 40, which may be older than some of the other mothers posting here!) We had planned a Banff / Glacier trip – including e.g. 2 nights in a hike-in only chalet via a 7 mile trail – before knowing I would be pregnant. I already think the hike-in chalet won’t work for me. (I’d have to carry our stuff, as my husband would take our daughter). And now I’m a little worried about the trip in general – I worry that we’re going all this way to somewhere beautiful, and I will only be able to do short (crowded?) trails and it will feel like a “waste” – or that I will be too uncomfortable to do much of anything. (I can’t really remember what 30 weeks feels like!) On the other hand, if we have to stay toddler-friendly for a few years anyway, it’s not like postponing to next year or the year after would make much difference…. And we really want to get out into nature somewhere beautiful this year! I suppose I am looking for thoughts about how we can still do a fun, worthwhile trip, even with the constraints of being 30+ weeks pregnant. Thoughts? Hi Caro – so funny….I am pregnant with Baby #5 right now and realized I had planned things later in the pregnancy forgetting what it is like to be that pregnant. Amazing how we forget so easily! I think every woman is different, but I would honestly have a very hard time personally at 30-32 weeks trying to do a lot of hiking and sightseeing. However, I think that if you go into it knowing you’ll do more short trips and car rides, you’ll be ok. Maybe put off Banff/Glacier for at least a year and look more local? Wish I had a crystal ball (for myself AND you), but it really depends on the person AND the pregnancy! I had two premies and two full terms….so you just never know!!! Hi! I’m thinking of hiking 75 miles over 7-8 days in Patagonia at 28 weeks pregnant. I’m very fit. Does anyone have any experience with longer treks that far along in a pregnancy? I live in Hawaii and am pregnant with my first baby at 40. I had plans to hike Kings Peak in UT in about a month when I will be at 14 weeks. I am not acclimatized to elevations, but take hiking and back pack trips often to the mainland and backpack and hike here at about 7,000ft. The backpacking trip starts at about 9,400ft and then we would camp a night at 10,700ft and then summit to 13,700ft. At first I thought I might just stay at the campground and skip the summit, but not even sure I should do that? I plant to ask my doctor in a few weeks, but am looking for any advice. Hi and thanks for a great article! I’m torn between hiking the Maroon Bells 4 pass loop (only 26 miles but 4 x 12,500ft passes!) or sticking to day hikes on our trip to Colorado this July. Any thoughts on hiking at that altitude at 20 weeks pregnant? Also slightly worried about carrying a heavy pack at that stage – its my first baby and no bump yet but I’m guessing by 20 weeks I will have! In your experience how easy is it to backpack with a bump?! Thanks! So I am 20 weeks now, carrying my toddler on my back & I honestly feel amazing. It’s important that I rest when he naps. But we have been hiking since he was a little over one yr old & it’s part of our routine. Been blessed to have lived on mountains the last two yrs & easy accesss to fun workouts/walks/hikes. I hope to carry him as long as I can without jeopardizing the growing baby inside. Just listen to your body! Thanks for your post! Oh and yes lots of water. I’ll be more better too at that thanks to your encouragement! This is terrible advice. My mom hiked on Mammoth Mountain while pregnant with me and got sick due to exerting herself and altitude and now I have to live with a blind spot in my eye my whole life. If you are pregnant your body is not yours. Sorry. It is your child’s. Stick it out and lay on the couch. Take a walk every now and then sure but don’t go hiking around, don’t go up mountains, don’t go overboard exerting yourself. If you’re keeping the child that is your decision and you should do everything you can to keep it safe, your happiness comes second.